Unencumbered is the likely favourite going into this Saturdays Two Year Old Magic Millions. Unencumbered has won four of his five starts and has the punters support with one punter placing $7500 on him before the barrier draw which is on Tuesday. “He’s been super impressive winning his last couple of starts, nothing seems to faze him and you know he will be strong at the end of a fast run 1200,” Felgate said. There has been some attention to some of the other 2 year olds with Invisible into $5.50 from $6.00 and Oakleigh Girl starting at $13 and slimming into $11. Sportsbet on the other hand have seen some interest in Oakleigh Girl even though she finished a well beaten forth to Unencumbered in her last start. “Oakleigh Girl got caught in a speed battle last start and tired, but she was far from disgraced. 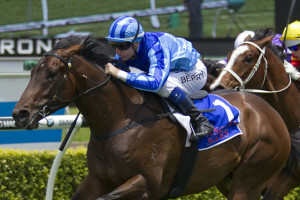 It appears punters are willing to forgive that run, as there has been rally for her again,” Sportsbet’s Ben Hawes said. Sweet Idea has been getting all the punters attention this week for the 3 year olds Magic Millions race. The Gai Waterhouse trained race horse sits at $4.80 ahead of Enquare who is at $5.50. Sweet Idea finished 2nd in the 2yr old Magic Millions last year so is expected to do well. Both Sportsbet and Sportingbet are offering free bets for this weekends missive day of racing. Sportsbet are offering a $25 free bet just for depositing $10 into your new Sportsbet account. See the Sportsbet site here to take advantage of this promo. Sportingbet have a massive $250 free bet promo. Simply use the promo code on this page and make your first bet. They will match your first bet 100% plus another $50. Eg. Bet $50 and get $100 or bet $200 and bet $250. See the Sportingbet site here for more info on this offer.